No I haven’t gone quackers just yet, but recently its come to light that I have a fascination with all things bird like. It could be something to do with my surname being ‘Wren’ or that I’m ‘an early bird’ rather than a ‘night owl’ (oh the puns could go on forever!) or the fact that those darn cute birds are bang on trend! 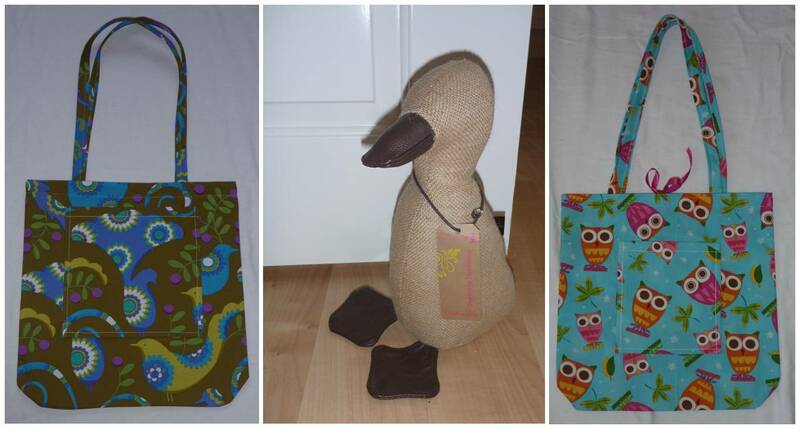 Looking around my house birds come into play quite a bit, from my country bumpkin Laura Ashley curtains in the kitchen, blue bird print dinner mats and coasters, to a very cute jute duck door stop from Mollie and Fred. In fashion birds have always played a part but seem to be creeping in more now from bird print play suits, jewellery, accessories, even shoes – you name it those pesky two winged mammals are making an appearance and are here to stay. So, it only seemed right that Country Bumpkin Chic embraced the bird print into some funky shoppers. Back in the summer I bought some cute fabric from my fave place Fabric Rehab: a playful owl print which would be great for a girl attending a birthday party and the very sophisticated khaki bird with show off plume of feathers, perfect for the girl about town. And my next project, yep, you guest it more birds – well just one more, I couldn’t resist the turquoise equivalent of the sophisticated bird print. Previous Post Autumn has officially arrived! I love the bird print, it's gorgeous. You must post the turquoise ones have a feeling that ones going to be even better. V impressed!